A whole new model for 2008, the AquaTrax® F-15X features a turbocharged 1,470 cubic centimeter engine plus an all-new hull that delivers an improved ride, better feel on the water and more splash protection than previous AquaTrax-the perfect recipe for on-the-water fun. Intake grate is bolted and sealed directly to the ride plate, eliminating the need for silicone sealer and reducing maintenance. The Ignition Control System (ICS) senses low oil pressure and/or abnormally high coolant temperatures and acts to limit or shut off engine operation if necessary. If oil pressure drops below the optimum level, the ICS limits engine speed to 3,000 rpm. AquaTrax's selectable Limit Mode provides a lower top-speed setting, ideal for beginning riders, borrowers and rental users. The system displays "Limit Mode" on the multifunction display when activated and can be reset with push-button controls. Electronic keyless ignition system (ID mode) allows operator to select from 999 possible identification numbers to effectively deter unauthorized use. Waterproof instruments feature a digital LCD for speed (mph), trip distance (miles), travel time (hours and minutes), clock and engine hour meter. An LCD analog bar-graph display for engine speed and fuel level indicates remaining minutes left to ride. Also, there is a flashing indicator light and audible alarm for fuel level, battery charge, coolant temperature, oil pressure and fuel injection. The ECU self-diagnostic system cycles at start-up and operates continuously during operation to provide immediate troubleshooting and warning functions. Operational lanyard tethers the ignition button to the operator's wrist or personal flotation device (PFD) and stops the engine if it becomes unplugged. The fully sealed fuel system is leak-free and vapor-free, eliminating the possibility of water contamination. Anticorrosion treatments for die-cast aluminum components include Alumite surface plating with an additional Superlac topcoat for exterior components, and epoxy-resin-based primer applied to coolant-exposed parts before Alumite treatment. Extensive use of stainless-steel, chrome-plated and zinc-plated stays and fasteners. Waterproof electrical couplers and spark plug/coil caps. Rubber engine mounts feature two-phase damping to simultaneously minimize engine vibration and engine shock when the AquaTrax traverses rough water. Simple and durable mechanical cable steering system directs the jet-nozzle's thrust. Hand-operated controls include right-handlebar-mounted trigger-type throttle, sealed stop and start buttons on the left handlebar and a left-hand-operated Reverse handle for easy docking maneuvers. Durable, paddle-type speed-sensor assembly is flush-mounted on the bottom of the ride plate to provide accurate performance in a variety of conditions. Handlebars are equipped with a cushioning pad. Dual wide-view, color-matched, aerodynamic mirrors are both attractive and functional. Seat cushions are made from urethane foam material and covered with UV-resistant marine-grade vinyl to enhance durability and long-term appearance. Fire extinguisher storage box is located in the front cargo area. Fully sealed, maintenance-free 18AH battery. Stern-mounted trailer tie-down loops provide convenient points for securing the AquaTrax during transport. Lightweight, liquid-cooled, DOHC 16-valve, 1,470 cubic centimeter fuel-injected, 200-brake horsepower, turbo-charged dry-sump, four-cylinder engine features a one-piece upper-crankcase/cylinder block engineered to withstand the rigors of marine duty. The inherently efficient, low-emissions four-stroke design consumes less fuel than a comparable two-stroke engine and meets CARB three-star and EPA emissions standards. Exceptional high performance is provided by a water-cooled IHI turbocharger with water-cooled intercooler. The AquaTrax turbocharger produces a maximum boost of 10 psi to generate more power than a normally aspirated engine. The turbine bearing is an enclosed, ceramic-ball design that withstands sustained high-rpm compressor operation while providing nearly vibration- and friction-free performance. Water cooling of the turbocharger housing maintains optimum turbine operating efficiency, while the water-cooled intercooler ensures a denser intake charge to provide maximum power and combustion efficiency. An Electronic Control Unit (ECU) monitors atmospheric pressure, boost pressure, engine speed, oil and water temperature, intake air temperature and an engine knock sensor to manage an electronic wastegate valve that controls turbocharger boost, protecting vital engine components and maintaining long engine life. Side-mounted cam chain and ultra-narrow cylinder-sleeve spacing reduce engine size and weight. Crankshaft main bearings feature a micro-grooved bearing surface to improve oil retention and bearing durability as lateral loading occurs throughout a broad range of operating conditions. DOHC-actuated valves use a simple, lightweight and direct cam-over-bucket design. Four-valve cylinder-head design with a narrow 30-degree included valve angle creates a compact combustion chamber for optimum efficiency and power output at all rpm levels. Silent-type cam chain reduces engine noise, while an automatic chain tensioner reduces maintenance. Automatic idle adjustment eliminates the need to fine tune. Winged intake grate provides a smooth flow of water to the impeller, reducing vibration and noise. Unique gear-driven dual engine-balancer system virtually eliminates high-frequency engine vibration. Oil jets located on the crankcase main journal castings continually cool piston undersides, ensuring consistent operating temperatures and even better durability under maximum power. Forged pistons and connecting rods are designed to withstand the rigors of turbocharging. The top piston ring land is anodized, and a chrome-plated top ring further enhances durability. Four waterproof, transistorized, direct-ignition coils integrate the spark plug cap and the ignition coil to produce a high-voltage, long-duration spark, providing maximum performance at high engine output levels. Iridium-tip spark plugs produce maximum spark performance and minimal carbon buildup for consistent engine operation and long spark plug life. Air-intake system features an intake port mounted centrally in the hull and a labyrinth airbox construction with paper air filter. Together, they keep water out of the engine during normal operation and if the craft is accidentally overturned. High-pressure programmed fuel injection (PGM-FI) delivers fuel to a single 54mm throttle body. Fuel is delivered through four laser-drilled holes in each of the four injector nozzles, producing a highly combustible air/fuel charge for maximum combustion efficiency and power. The ECU provides digital 3-D fuel-injection maps for each cylinder, creating the ideal fuel mixture and spark advance settings. A sophisticated throttle sensor and advanced fuel-injection mapping combine to produce smooth and linear throttle response, responding precisely to minor throttle and wastegate changes to maximize driveability, acceleration and drive-pump performance. Special, compact oil-cooled alternator also drives the oil pump, contributing to the engine's lightweight design. Engine cooling system allows water from the jet pump to circulate through the engine and is directly injected into the exhaust body, ensuring consistent operating temperatures and quiet operation. Engine-cooling water also circulates through the turbocharger housing to ensure optimum compressor function. - Engine-cooling water also circulates through the turbocharger housing to ensure optimum compressor function. Cooling system design permits coolant water to drain easily from the water jackets when not in use for easy winterization. Dry-sump engine incorporates an oil reservoir mounted adjacent to the cylinder bank. The tank shape and location, together with a specially designed internal multi-baffle system, optimize engine lubrication under the wide variety of marine operating conditions. Engine output is directly coupled to the jet pump drive via a rubber damper, providing shock-free, efficient power transfer while minimizing lateral crankshaft load forces. Axial-flow single-stage Solas 155 millimeter jet pump with three-blade impeller is precisely matched to the engine power characteristics. A proprietary Honda impeller design and ECU control of the turbocharger wastegate minimize pump cavitations, resulting in quiet operation and extended impeller life. Pump servicing features include easy-to-disassemble pump, driveshaft and driven coupling, and an easily accessible driveshaft-bearing grease fitting. Dry-sump design allows the engine to be mounted low in the hull, resulting in a very low center of gravity that contributes to the AquaTrax's exceptional handling performance. Raised bond-line design aids in docking and provides excellent splash protection. Sponson design further contributes to the AquaTrax's low-speed maneuverability and high-speed stability. Strong, lightweight fiberglass reinforced plastic (FRP) hull and deck are permanently joined and sealed at the gunwale, providing the AquaTrax with a distinctive and attractive profile. The liner-type FRP inner hull with encapsulated styrofoam is more rigid than a typical single-hull design. AquaTrax hull is designed to be a stable platform when remounting from deep water and easily uprighted in the case of an accidental overturn. Foot well areas have an anti-slip surface to provide sure-footed comfort when mounting, operating and dismounting. Forward-located, large-capacity 18.5-gallon polyethylene fuel tank is attached to the hull with rubber-cushioned hold-down straps. A two-way valve controls internal tank pressure and prevents water intrusion or fuel leakage if the hull is accidentally overturned. Abundant storage is available in three sealed compartments: a large 19.8-gallon front storage box located under the front hood, a 1.7-gallon compartment located in front of the rider and a 1.6-gallon rear compartment under the seat. Multi-function meter indicates approximate remaining ride time based in fuel consumption in minutes. 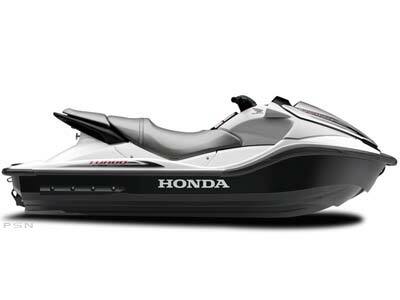 Honda Ignition Control System (ICS) protects the engine from abnormal operating conditions but can allow the rider to operate the PWC in reduced power mode. Gear-driven dual engine balancer system virtually eliminates high-frequency engine vibration. Crankcase breather system featuring three breather chambers prevents oil loss or breather system clogging if the PWC is accidentally overturned. AquaTrax hull design provides excellent overall stability and exceptional low- and high-speed turning performance without sacrificing low-speed maneuverability.